Photo by Werner Mehl, www.kurzzeit.com, all rights reserved. However, if you ask a typical reloader for the rotational rate of his bullet, in revolutions per minute (RPM), chances are he can’t give you an answer. Knowing the true spin rate or RPM of your bullets is very important. First, spin rate, or RPM, will dramatically affect the performance of a bullet on a game animal. Ask any varminter and he’ll tell you that ultra-high RPM produces more dramatic hits with more “varmint hang time”. Second, RPM is important for bullet integrity. If you spin your bullets too fast, this heats up the jackets and also increases the centrifugal force acting on the jacket, pulling it outward. 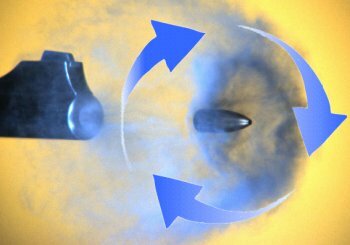 The combination of heat, friction, and centrifugal force can cause jacket failure and bullet “blow-ups” if you spin your bullets too fast. Additionally, bullet RPM is very important for accuracy. Nearly all modern rifles use spin-stablized bullets. The barrel’s rifling imparts spin to the bullet as it passes through the bore. This rotation stablizes the bullet in flight. Different bullets need different spin rates to perform optimally. Generally speaking, among bullets of the same caliber, longer bullets need more RPM to stabilize than do shorter bullets–often a lot more RPM. It is generally believed that, for match bullets, best accuracy is achieved at the minimal spin rates that will fully stabilize the particular bullet at the distances where the bullet must perform. That’s why short-range 6PPC benchrest shooters use relatively slow twist rates, such as 1:14″, to stabilize their short, flatbase bullets. They could use “fast” twist rates such as 1:8″, but this delivers more bullet RPM than necessary. Match results have demonstrated conclusively that the slower twist rates produce better accuracy with these bullets. The lesson here is that you want to use the optimal RPM for each bullet type. So how do you calculate that? Bullet RPM is a function of two factors, barrel twist rate and velocity through the bore. With a given rifling twist rate, the quicker the bullet passes through the rifling, the faster it will be spinning when it leaves the muzzle. To a certain extent, then, if you speed up the bullet, you can use a slower twist rate, and still end up with enough RPM to stabilize the bullet. But you have to know how to calculate RPM so you can maintain sufficient revs. Calculating the RPM based on twist rate and MV gives us some very important information. Number one, we can tailor the load to decrease velocity just enough to avoid jacket failure and bullet blow-up at excessive RPMs. Number two, knowing how to find bullet RPM helps us compare barrels of different twist rates. Once we find that a bullet is stable at a given RPM, that gives us a “target” to meet or exceed in other barrels with a different twist rate. Although there are other important factors to consider, if you speed up the bullet (i.e. increase MV), you MAY be able to run a slower twist-rate barrel, so long as you maintain the requisite RPM for stabilization and other factors contributing to Gyroscopic Stability are present. In fact, you may need somewhat MORE RPM as you increase velocity, because more speed puts more pressure, a destabilizing force, on the nose of the bullet. You need to compensate for that destabilizing force with somewhat more RPM. But, as a general rule, if you increase velocity you CAN decrease twist rate. What’s the benefit? The slower twist-rate barrel may, potentially, be more accurate. And barrel heat and friction may be reduced somewhat. Just remember that as you reduce twist rate you need to increase velocity, and you may need somewhat MORE RPM than before. (As velocities climb, destabilizing forces increase somewhat, RPM being equal.) There is a formula by Don Miller that can help you calculate how much you can slow down the twist rate as you increase velocity. That said, we note that bullet-makers provide a recommended twist rate for their bullets. This is the “safe bet” to achieve stabilization with that bullet, and it may also indicate the twist rate at which the bullet shoots best. Though the RPM number alone does not assure gyroscopic stability, an RPM-based calculation can be very useful. We’ve seen real world examples where a bullet that needs an 8-twist barrel at 2800 FPS MV, would stabilize in a 9-twist barrel at 3200 FPS MV. Consider these examples. Of course max velocity will be limited by case capacity and pressure. You can’t switch to a slower twist-rate barrel and maintain RPM if you’ve already maxed out your MV. But the Miller Formula can help you select an optimal twist rate if you’re thinking of running the same bullet in a larger case with more potential velocity. Share the post "Calculating Bullet RPM — Spin Rates and Stability"
Hornady provides a good, basic Guide to External Ballistics, covering the key principles of small arms ballistics. This is a good starting point to learn how bullet shape, wind, and velocity determine how bullets perform in flight. 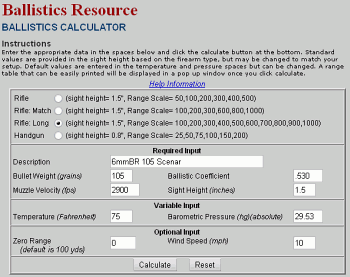 Hornady also offers a free, interactive Ballistics calculator on its web site. While not as detailed or sophisticated as the JBM web ballistics calculator, the Hornady Ballistics Calculator is clean, simple, and easy to use. This will generate bullet drop in minutes of angle (MOA) at distances out to 1000 yards, along with wind drift in MOA and inches. The Hornady ballistics calculator also allow you to pre-select for handgun, short-range rifle, match (High Power) rifle, and long-range rifle. This simplifies the data presented, giving you just the ranges you need. Share the post "Hornady Guide to External Ballistics"